Family Solanaceae Juss., genus Capsicum L.
2n=24. Perennial, grassy plant cultivated as an annual. Root system is a tap root. The stalk is 4-5-hedral, 20-125 cm tall, grassy, in process of growth becomes coarse and woody. Monopodial branching before formation of the first flower, then simpodial. Plants may be single-stalked with a branching allocate bole, semi-bole (1-3 short shoot in the lower part of the main stalk), or bushy. Leaves smooth-edged, ovate to lanceolate, light to dark green in color, on long leafstalks, single or collected in a rosette. Flowers are formed in places where the stalk branches. Flower bi-sexual with a white, 5-hedral corolla. Facultative self-pollinator. Fruit is a false hollow berry, polyspermous, 2-4-camerare, occurring in various forms (tomato-like, bell-shaped, cone-shaped, cylindrical) and colors. At the time of consumer ripeness, fruit.s color ranges from white to dark green; at the time of biological ripeness, fruit.s color is dark violet, red, dark red, orange, yellow or cream. Length 0.8-25 cm; diameter 1-15 cm; thickness of fruit walls 1-10 mm; weight 5-200 g. Fruits drooping or pointed toward the stem. Seeds on placenta, located at the base of fruit, light yellow, flat or slightly curved. 150-200 seeds have a mass of 1 g.
Early-ripening varieties: Vinni Puh, Dar Tashkenta, Donetskij rannij, Zdorovje, Kolobok, Krepysh, Mjasistyi; middle-ripening varieties: Biruitorul 65, Bogatyr, Bolgarskij 79, Venti, Victoria, Gogoshary mestnyj, Korenvskij; late-ripening varieties: Granatovyj, Rubinovyj. 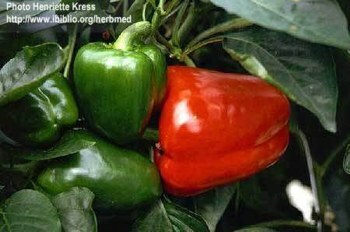 Capsicum annum occurs in Central and South America as a wild plant. It began to be cultivated about 6 thousand years ago. Sweet pepper has taken the place of hot pepper in cultivation. At the end of the 16th to the beginning of the 17th century, it was introduced to Russia and cultivated as far north as 55 degrees of northern latitude, mainly in Transcaucasia, Middle Asia, Moldova, Ukraine, the Northern Caucasus, and the Lower Volga region. Requires much heat, moisture, and soil fertility. It does not withstand frosts. Optimum temperature for growth is 28-29°C (22-24°C in the Nonchernozem zone). Growth stops at 13°C. Plant requires short days (14 hours). Photophilous. The vegetative period lasts 90-95 days (early-ripening varieties), 110-120 days (middle-ripening varieties), or 130-140 days (late-ripening varieties). Prefers light, rich soil. Does not like salty, heavy, clay, cold, sour soil (optimum pH 6-6.6). Fruits contain 5.8-10% dry substances, including 2.6-4.9% sugars, 1.36% crude cellulose, 1.5% crude protein; pectins; organic acids; mineral salts; nitrogenous substances; and essential oils. Fruits are rich in vitamins C and D (beneficial to the vascular system), as well as vitamins A, B1, and B2. Pepper used as a fresh vegetable, in various dishes, for preserve, and in dried form. Productivity ranges from 10-12 to 40-45 tons per hectare. Bekseev, S.H. Vegetable cultures of the world. 1998. The encyclopedia of truck farming. St.Petersurg. Gazenbush, V.L. 1958. Pepper - Capsicum Tourn.//Cultural flora of the USSR. V. 20 Vegetable nightshade family. Ed. by D.D.Brezhnev. Moscow-Leningrad. pp 394-487. Hrenova, V.V. 1981. Pepper and eggplants. Moscow. Il'enko, T.S. 1976. Sweet pepper. Kishinev. Mezentseva, A.I., Belousova, K.K. 1980. Tomato, pepper, eggplant. Perm. Pleshkov, K.K. 1991. Vegetable growing of the open and closed ground. Kiev. Zhuleva, V.M., Cherenok, L.G. 2002. Tomatoes, pepper, eggplants, ground cherry. Moscow.